Laser-etched QR code on Plexiglas, constructed into square trapezohedron 'reliquary' with the assistance of Alexandra Lemus Rodriguez and Antoliano Nieto, mock ossified form (Mock Ossification V) in gel wax secured inside. Abandoned in the Basilica, Saint Joseph's Oratory, Montreal, QC. The artist was tracked down by oratory staff and security via the QR code, after 24 hours on public display. Following contact with the Hexagram research facility from authorities at St Joseph’s Oratory, the artist was notified of the specimen’s whereabouts and a pick up was requested. 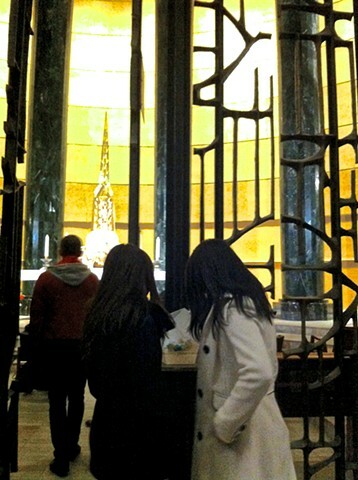 Two research team members met with security in the Sacristy of the Oratory to receive the specimen object. Initially some administrative confusion nearly resulted in the research team members leaving with a tissue sample of Saint André, that had also been scheduled for pick up the same day and intended for delivery to Gatineau. Once the true specimen was located, Oratory security informed the researchers that the “bone” was believed to have been stolen from The Maude Abbott Medical Museum Osler Collection at McGill University. Featured with constructed bio-based narrative (fictitious osteobiography) on The Ossificatorium interactive website.